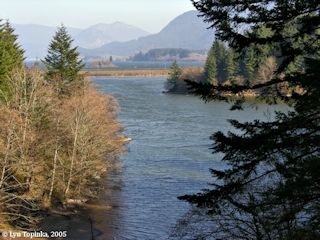 "Fort Gilliam, Columbia River, Washington ..."
Click image to enlarge Ashes Lake, Washington. View from Ashes Lake Road, looking south towards the Columbia River. Image taken February 26, 2005. Fort Gilliam, an 1848 supply depot, and Fort Lugenbeel, an 1856 military blockhouse, were located above Ashes Lake. This area was known as the "Upper Cascades" or "Upper Landing". Throughout history four different forts or blockhouses existed along a rough 4.5 mile stretch of the Columbia River Gorge between Hamilton Island and Cascades Locks, known throughout history as the "Cascade Rapids". The first fort built was Fort Gilliam, established in 1848 and located at the upper end of the Rapids. Fort Gilliam was a supply depot for the Cayuse Indian Wars. Next came Fort Cascades, built in 1855 at the lower end of the Rapids. It was built to defend the portage and was known as the "Lower Blockhouse". Next came Fort Rains, also built in 1855. It was located at the lower end of the portage around the "Upper Cascades" and was known as the "Middle Blockhouse". The last fort built was Fort Lugenbeel, built in 1856 and located at the upper end of the "Upper Cascades" portage, and was known as the "Upper Blockhouse". Fort Gilliam was established in 1848 as a supply depot for the Army for use in the upcoming Cayuse Indian War. Fort Gilliam was established at the "upper landing" of the Cascade Rapids portage, a spot which would become the location of Fort Lugenbeel. The fort was named after Colonel Cornelius Gilliam, colonel-commandant of the volunteer regiment of Oregon organized to confront the Indian situation. Starting with two hundred and twenty men he [Colonel Gilliam] arrived at Vancouver the same day in company with Commissary-General Palmer, where together they purchased, on their own credit, eight hundred dollars' worth of goods necessary to complete the outfit of the companies. The men were mounted but had no pack horses, and the provisions were conveyed in boats, which, owing to their slow movements, delayed the progress of the troops. On arriving at the cascades a portage of several miles was necessary to reach Fort Gilliam, and the ferry there established. The wind blowing through the gorge of the mountains made crossing to the Oregon side very difficult. A road from the lower to the upper end of the portage being a necessity in order to transport the cannon and other heavy material, a company was left behind to open it." Early in January, 1848, Colonel Gilliam started up the river from the rendezvous at Portland, arriving at Vancouver the first day. ... he purchased such supplies as he stood in urgent necessity of, pledging his own credit and that of Commissary-General Palmer, who accompanied him, for the payment. Having reached the cascades, he left there one company to construct a road from the lower to the upper portage, himself and the balance of his command proceeding to Fort Gilliam ..."
Source: "An Illustrated History of Klickitat, Yakima and Kittitas Counties: ...", 1904.